I’ve been doing a good bit of baking lately. My sister (who is GF) recently had her first baby, so I have made her these scones a multitude of different ways… with raspberries, strawberry-walnut, and banana-walnut. 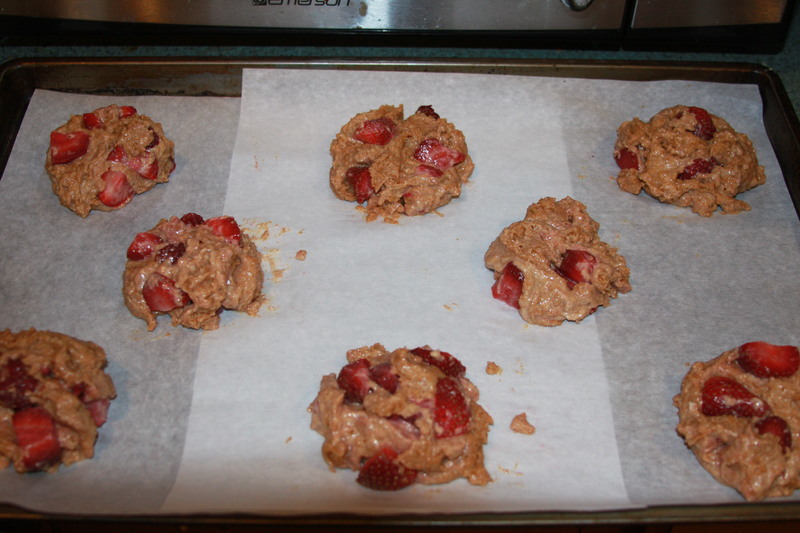 These scones are very versatile and I have found that practically any fruit works wonderfully! I really enjoyed them when I used 1 cup of bananas and 1/4 cup of chocolate chips 🙂 I can truly say I dont think anyone would know that these are gluten free*. And the best part about using non-gluten flour is that you dont really have to worry about overmixing! These scones are lightly sweetened with agave nectar & are so light it is almost as if they fell right out of the sky. I love them! * Spelt flour is a good subsitute for people with a low intolerance for wheat, though some people with serious wheat allergies, such as those with celiac disease, are also allergic to spelt. In that case, you should try replacing the flour with a 100% gluten free baking mix (most grocery stores carry a blend for general flour replacing). 1- Preheat the oven to 375. Line a large baking sheet with parchment paper. In a bowl, whisk the spelt flour, baking powder and salt. 3- Sccop the batter (I like to use my 1/3 cup) onto the baking sheet. If you make them smaller you can actually make 12. However, I found I prefer the size of the scones when I make 7-8 (making each one < 1/3 cup). You may lightly brush the tops with oil, if desired. Bake for 17-20 minutes until golden. Once they begin to turn golden, I usually peek under a scone to check how dark the bottom is to decide when to pull them out! Let cool slightly and then devour! 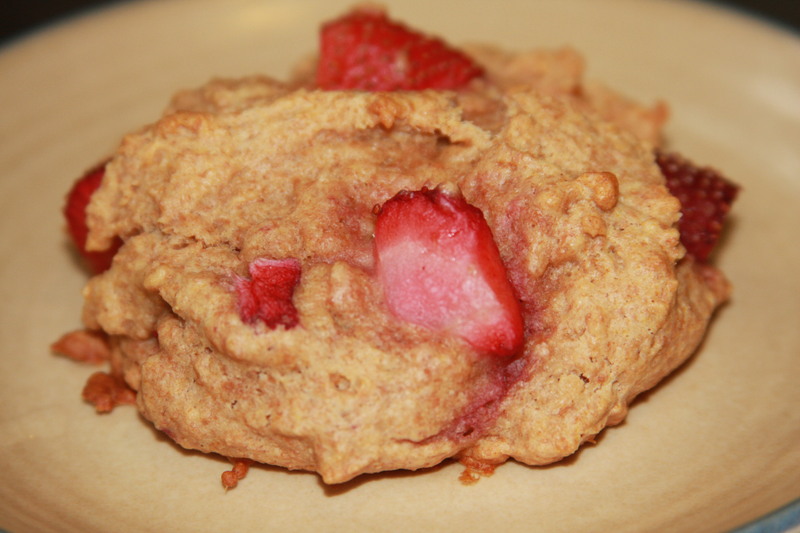 Ahh.. a satisfyingly simple strawberry gluten free scone! This entry was posted in baking, breads, breakfast, gluten free, muffins, snacks, Vegan and tagged baking, breakfast scones, cooking, gluten free, gluten free scones, gluten free spelt scones, scones, spelt scones, Vegan, vegetarian. Bookmark the permalink. These look delicious! 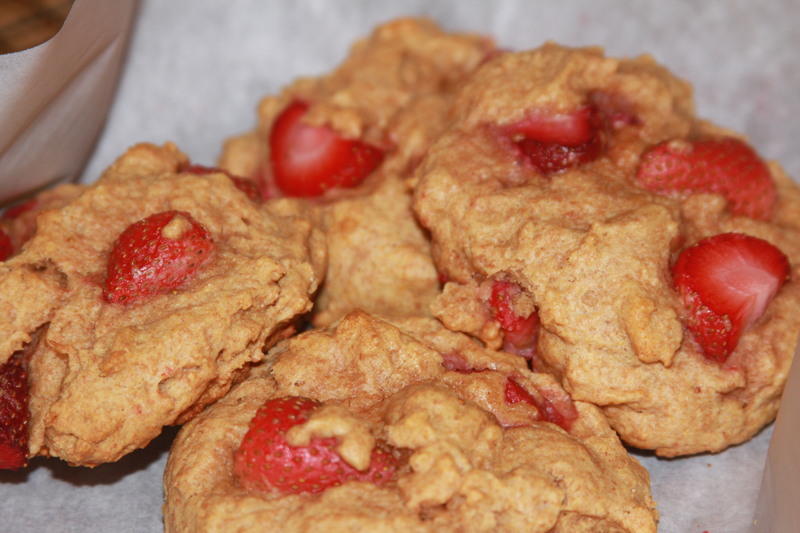 I am always looking to add gluten-free recipes to my repertoire, we have so many GF friends and family members, it is nice to have some options! Thanks for sharing.